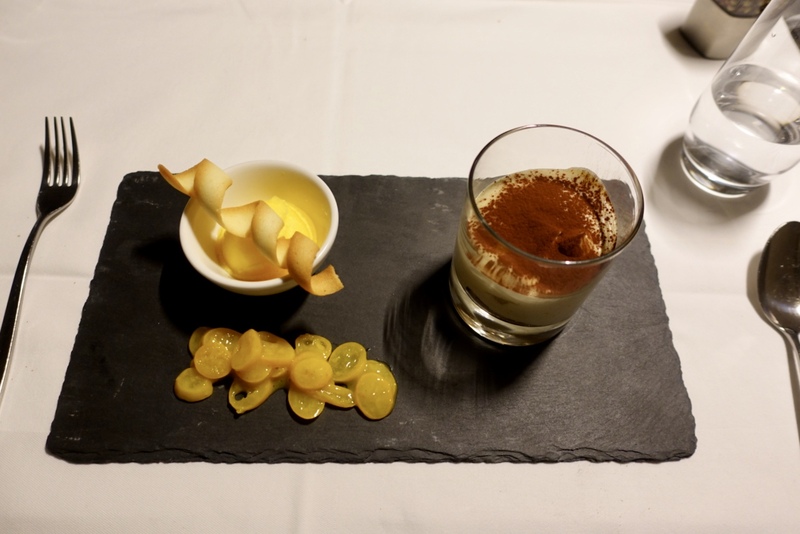 Aarau, Olten’s neighboring town, has picked up recently when it comes to award-winning restaurants. A few years ago, Olten, my home town, was the leader when it came to such restaurants. This year, Aarau took over the leading position. Restaurant Kettenbruecke at the hotel of the same name contributed significantly to this development. After having opened in spring 2016 it was awarded 13 Points Gault-Millau – the most popular restaurant guide in Switzerland – in this year’s edition. I have to admit that the restaurant came into my focus only at the moment when it was positively mentioned in the Gault Millau restaurant guide. Although having known about the restaurant’s existence, I was discouraged from visiting it by the mixed reviews at TripAdvisor. 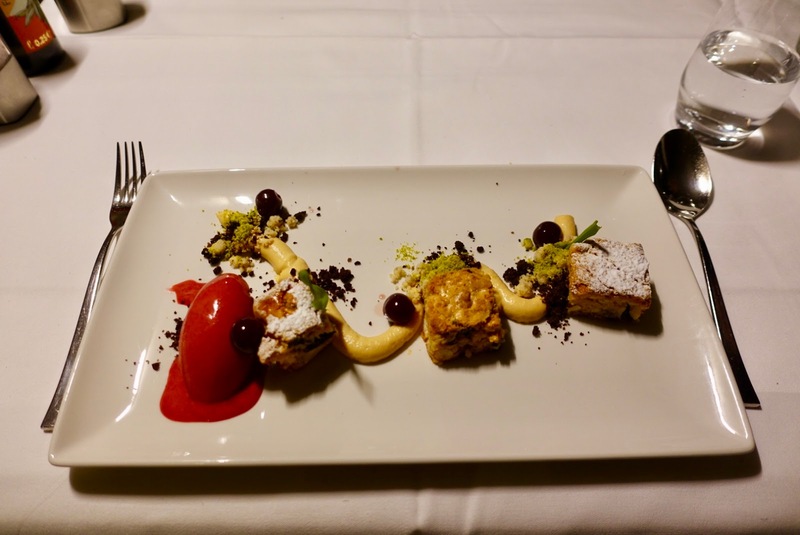 After the 2019’s edition of the Gault Millau Switzerland restaurant guide had been published recently, I decided that I had to check out the Restaurant Kettenbruecke at the next opportunity. And I chose it as first restaurant to visit after my month-long trip to Oceania, more of the later you will find soon on my blog. 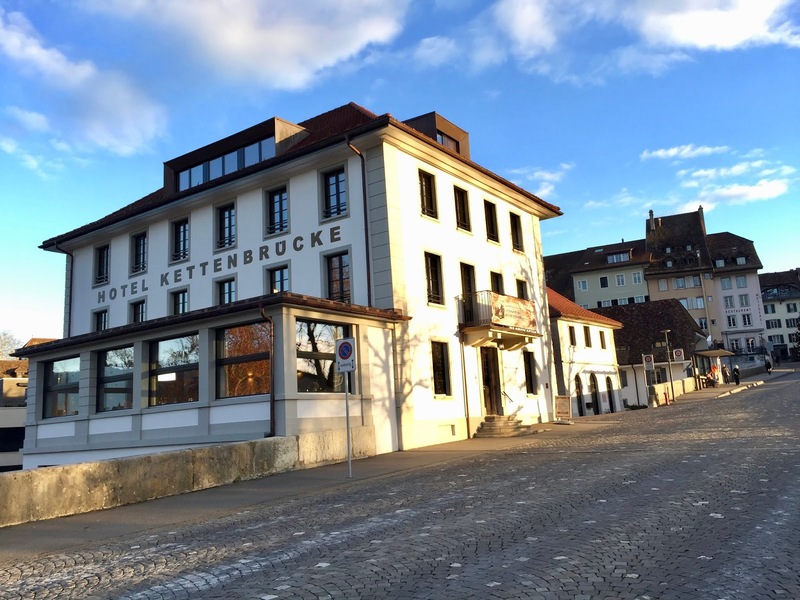 Hotel Kettenbruecke is favorably located at the edge of Aarau’s beautiful historic old town. The property is steeped in history. It was built in 1830 as a customs house and was later converted in a hotel. Hotel Kettenbruecke had been one of Aarau’s most prominent gastronomic institutions before it was used as a location for a nightclub. A few years ago, it was decided to remodel it as a hotel again. After a long construction time it was reopened in spring 2016 together with the affiliated restaurant of the same name. The restaurant is divided into three parts, a bar, a more casual restaurant with bare tables covered with white table runners and a fine dining part with white table cloths. The later – where my husband and I were seated on our visit – is housed in some kind of addition. It looks like an ancient form of a winter garden, without the plants but with windows on three sides. The fine dining restaurant is a bit separated from the other one which makes it a pleasant and quiet room. And because of the many windows you can sit here and observe what is going on outside, which is a nice thing to do. All three parts of the restaurant are tastefully decorated in a contemporary style. Everything is kept in dark brown and creamy beige colors. 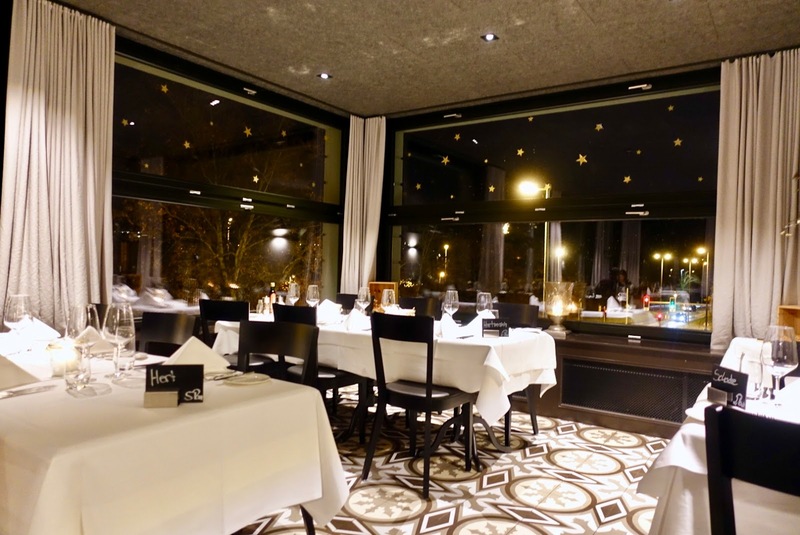 While the casual restaurant has a light parquet flooring, the fine dining space has a patterned tile floor. You get here international and Swiss classis, modernly interpreted by the large team around the German Joerg Kroell who has been on board since day one and worked already with a three-star Michelin chef in Germany. He attaches much value to seasonality; the menu changes every two months. On the one hand there is a five-course menu that amounts to 118 SFR, from which you can choose four (97 SFR) or three courses (82 SFR), too. On the other hand, you can order from an a la carte menu with starters from 13 SFR (house salad) to 23 SFR. Mains are available as from 29 SFR (burger resp. a vegetarian dish), the most expensive dish costs 57 SFR (saddle of venison on our visit). Deserts range between 12 and 19 SFR. Prices are competitive compared to other restaurants of the same class (slightly upscale) in the area and they are in my opinion absolutely justified given the quality. 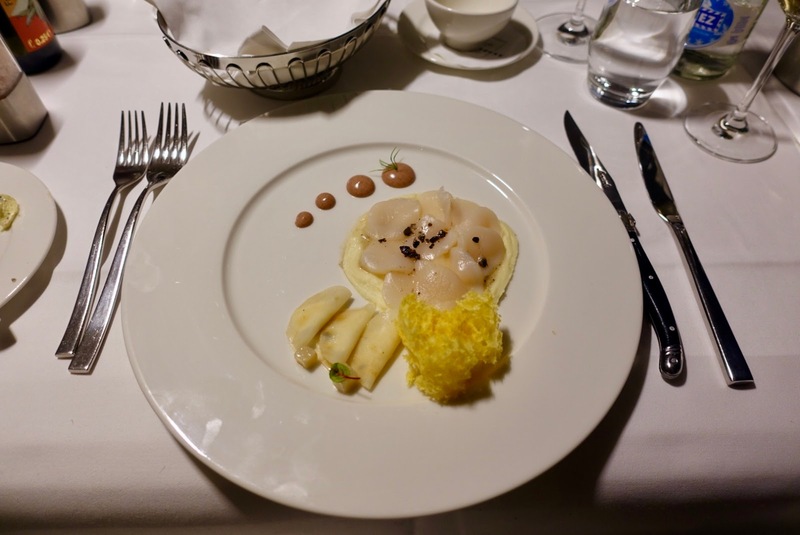 as a starter, I chose the lukewarm scallop carpaccio paired with celery and black truffle. Both dishes were immaculately prepared, worked well and tasted nice. 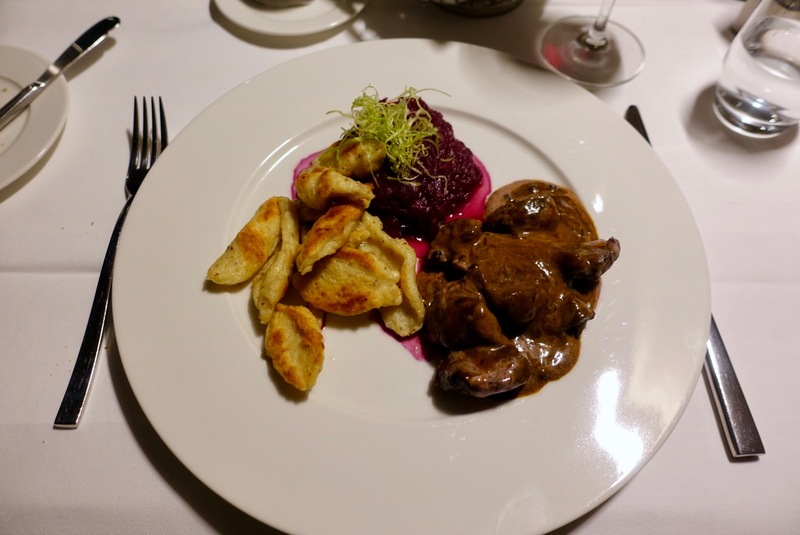 As a main, he opted for a game dish, venison stew with a delicious elder sour cream sauce, hazelnut pizokels (some kind of spaetzle) and apple red cabbage. I went for the Swiss Prim beef entrecote on a chorizo jus that came with exquisite pretzel knoedels (dumplings) and flower sprouts. Both of us were delighted at the quality and the originality of the creations. I chose the white brownie on caramelized milk cream paired with sour cherry sorbet. The sorbets were sublime – I am usually no big fan of them –, and the rest was also quite convincing although not terribly exciting. Here is still room for improvement. As we visited the restaurant in the pre-Christmas period, the place was very busy and both dining-rooms (the more casual one and the fine-dining space) were filled to capacity. We had to hang up our coats ourselves and were a bit concerned about what would lie ahead. Fortunately, our fears were groundless, at least when it came to the pace of the meal. Staff was gracious and accommodative, partly even fun – we had a nice conservation with the only male server –, however not seamless (some minor slips). 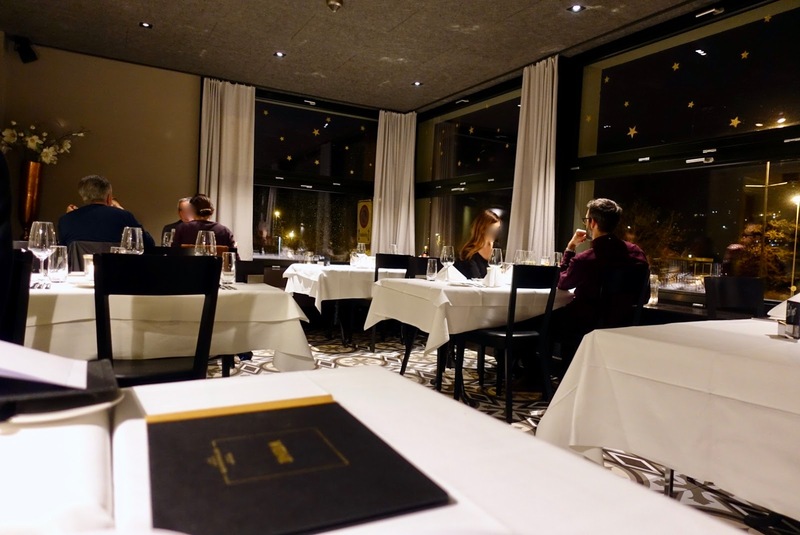 It is good news indeed that Aarau in the Northwestern part of Switzerland – between Basel, Bern and Zurich – has upgraded in the recent past when it comes to recommended fine dining restaurants. One of them is by any means the relative newcomer to town, Restaurant Kettenbruecke at the hotel of the same name. The Aarau institution was tastefully renovated and features a new contemporary look. I liked the casual chic décor of the place. Food, mainly classics with a modern twist, was well-made, tasty and adequately priced. Staff was amiable and helpful although seemed a bit unexperienced in places. 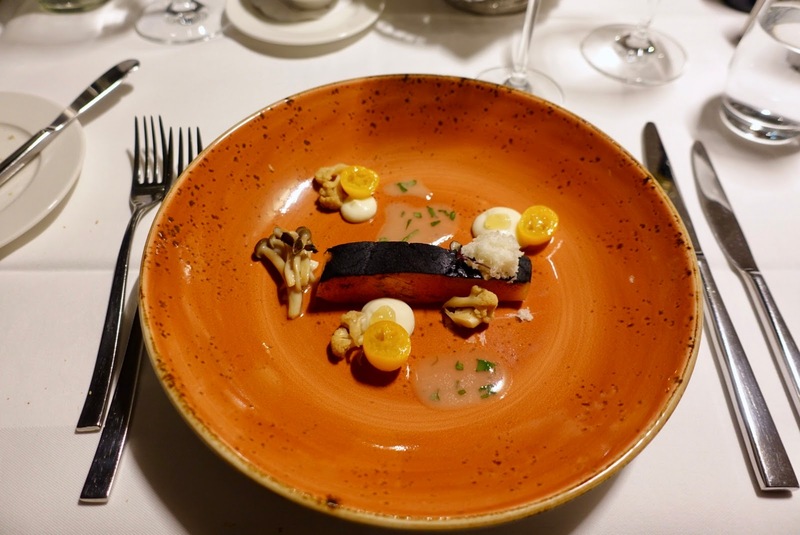 All in all, the chef understands his business and has considerable potential for the future. 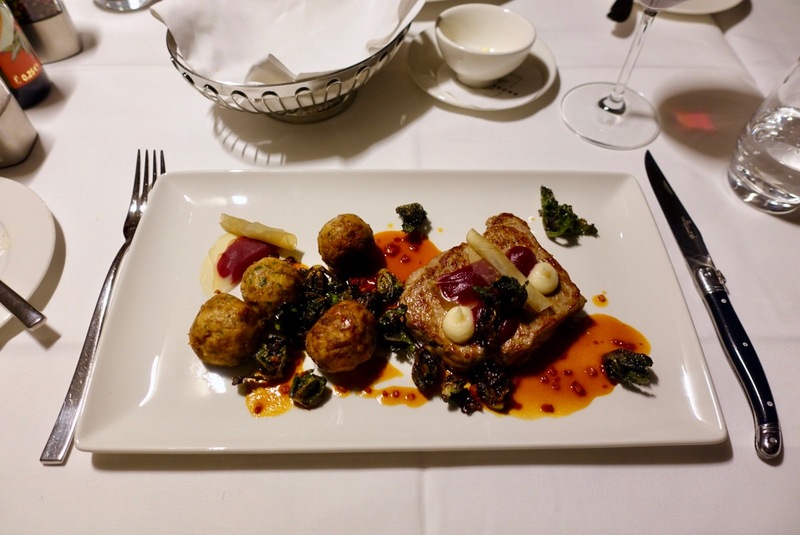 Together with the nice setting and minus some small imperfections of the service, the restaurant might become the best address in town for fine dining in a casual ambiance.